Objective – The learner will be able to create an abstract picture using different types of dots. 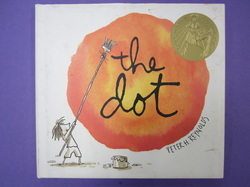 Procedure- Read The Dot by Peter H. Reynolds. This is a great book for reminding the students of the importance of their work and to build self confidence in creating art work. Have students draw as many different types and combination of dots with markers on coffee filters. I put the student dots on bright construction paper and have them autograph the pictures. Materials – Coffee filters, markers, construction paper, pencils.